Depending on what the evaluation is, I sometimes love marking and I sometimes am just not motivated to do it. Tests, quizzes and assignments that involve math... swoon! <3 Love it! Lab reports, projects and written assignments... those are tougher. I really have to work to motivate myself to get those marked quickly. I am going to try to improve over the weekend and into next week. I was very good this week though and marked a ton! I also had 3 sets of unit tests, 2 sets of projects and 1 set of presentations coming up, so no wonder I was motivated! How do you stay motivated to mark? Mine? Lock myself in my classroom and don't let myself go home until it's done. What do you find the most enjoyable to mark? Me? I quite like quizzes and tests. What is your most dreaded type of evaluation to mark? Me? Lab reports. Not the answer you were expecting from a Science teacher? I'd even prefer to mark essays! With lots of marking out of the way today, I decided to focus on some neglected loves: Bavarian Inn Root Beer from Frankenmuth (Thanks, Mom#2!) and TpT. When I was printing off my 50+ page package of Grade 9 Chemistry Resources I re-discovered this gem I made last semester. Check it out if you teach Chem. 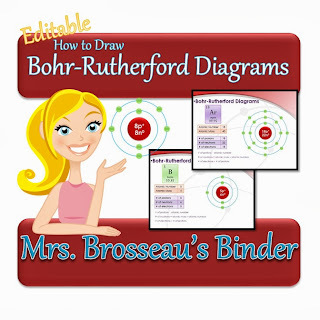 I find it saves me soooooo much time when I teach Bohr-Rutherford diagrams!